Description: Meet Harold Fry, recently retired. He lives in a small English village with his wife, Maureen, who seems irritated by almost everything he does, even down to how he butters his toast. Little differentiates one day from the next. Then one morning the mail arrives, and within the stack of quotidian minutiae is a letter addressed to Harold in a shaky scrawl from a woman he hasn’t seen or heard from in twenty years. Queenie Hennessy is in hospice and is writing to say goodbye. "He had never been good at expressing himself. What he felt was so big it was difficult to find the words, and even if he could, it was hardly appropriate to write them to someone he had not contacted in twenty years." "They believed in him. They had looked at him in his yachting shoes, and listened to what he said, and they made a decision in their hearts and minds to ignore the evidence and to imagine something bigger and something infinitely more beautiful than the obvious." "He understood that in walking to atone for the mistakes he had made, it was also his journey to accept the strangeness of others. As a passerby, he was in a place where everything, not only the land, was open. People would feel free to talk, and he was free to listen. To carry a little of them as he went. He had neglected so many things that he owed this small piece of generosity to Queenie and the past." "He had learned that it was the smallness of people that filled him with wonder and tenderness, and the loneliness of that too. The world was made up of people putting one foot in front of the other; and life might appear ordinary simply because the person living it had been doing so for a long time. 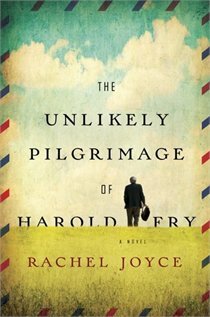 Harold could no longer pass a stranger without acknowledging the truth that everyone was the same, and also unique; and this was the dilemma of being human." Know what I am getting for the SIL and sister this year for xmas -- shhh don't tell them! I'm so glad that this book is living up to expectations. This has been on my To-Be-Read shelf on Goodreads for a few months, and I'm just now realizing that it's actually been released for two weeks! Agh! Why isn't this in my hands already? !